IN THIS ISSUE: New Ensembles: Schnabel (Robert Sanderl), Three Scenes from the Desert (Alex Stopa), New Solos: Danny Boy (Traditional; arr. Brian Mueller), Impromptu No. 3 (Schubert; arr. August Pappas), Tristesse (Chopin; arr. Benjamin Holmes), New Books: The Golden Age of Ragtime (Ralph Hicks & Eric Rath), Sequential Studies-Level 1 (Julia Gaines), Nine Minute Drill (Hicks/Rath), VDL Tips: Impose Sketch onto Template, Zero-G (Roger Carter). IN THIS ISSUE: Tapspace at 2018 TMEA, New Books: Nine Minute Drill (Ralph Hicks & Eric Rath), Sequential Studies for Four-Mallet Marimba – Level 1 (Julia Gaines), Scores for Festivals. 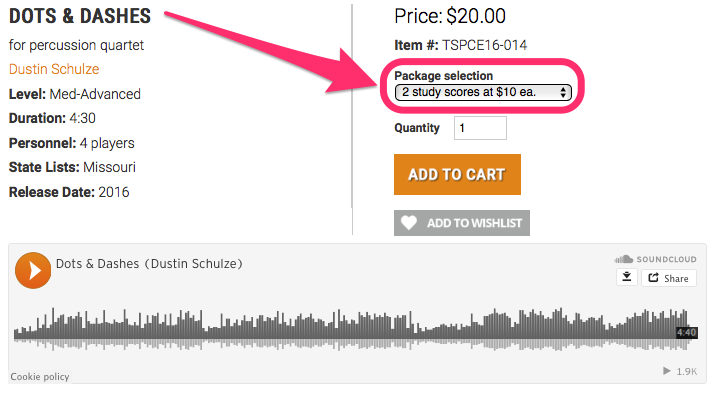 With festival season upon us, we’re very excited about the ‘study score’ options on our website. It makes securing extra copies of scores quick, easy, stress-free, and (most importantly) legal! Some of you may be familiar with the Festival Score 3-PACKS we used a few years ago. Well, it’s been improved! Rather than receiving a watermarked score that expires after your festival, we now offer the option to purchase two or three individual scores*, each at a significantly reduced price. You can use them for any number of reasons such as festivals, personal study, or rehearsals, and they can be used indefinitely. Search for your desired ensemble. Once you’ve navigated to the page of the product you wish to purchase, simply select how many scores you’d like from the Package Selection drop-down menu. If you only wish to purchase 2 or 3 copies of the score you do not have to change the Quantity, just keep it at 1. This will ensure you don’t get double or triple the amount of scores you require. Once you’ve selected how many scores you’d like to purchase, add it to your cart and check out. It’s that simple! Once we’ve processed your order, we will ship them to you. No paperwork, no photocopying, and no need to destroy your festival scores! It’s our sincerest hope that you find this process intuitive, easy, and a RELIEF. Best of luck at your festivals! *Study scores are only available for ensembles (individual parts not included), and not for duets, solos, or book products. IN THIS ISSUE: Escape Rooms, Tapspace at 2017 MWC, New Releases: A Second Look (Thomas R. Marceau), Melody in Repose (Michael Charles Smith), Deleclusiastics (Scott Fairdosi), Animal Cracker Rag (Brian Slawson), Beyond the Clouds (Jim Casella), Jalopy (John Herndon), Holiday Gift and Concert Ideas, Tapspace Mixtape 17.12. IN THIS ISSUE: Tapspace at 2017 PASIC, New Releases: Chemical Songs (Chad Heiny), Faded Lines (Andrea Venet), Windows of the Maloca (Jim Casella), Boom Bap (Nick Werth), Duende (Francisco Perez), Orchestrations of the Underground (Toby Fox; arr. by Kirk J. Gay), Holiday Gift and Concert Ideas. It’s official: the holiday season is upon us! Give the special percussionist in your life something they really want by consulting our list of holiday gift ideas. And if you’re still looking for some rum-pa-pum-pum for your upcoming concert, here are some holiday-esque ensembles that come together in a flash! IN THIS ISSUE: Zero-G (Roger Carter), New Releases: My Beautiful Chaos (Thomas R. Marceau), The Camino (Michael Charles Smith), The Small Stuff (Andrew Richardson), Max Power (Daniel Montoya Jr.), Mayhem (Daniel Montoya Jr.), Rhythm Rocket (John Willmarth), Guac is Extra (John Herndon), Tapspace Mixtape 17.08 edition. Roger Carter’s Zero-G is here! Zero-G is a lot jam from rudimental drumming legend Roger Carter and premiered by the 2017 Bluecoats drumline. This entire jam is based on a simple syncopated theme where the beat is obscured, giving the listener multiple interpretations of the pulse. This theme goes through many transformations, adding diddles, singles, flams, and different sticking patterns. Zero-G was premiered by the 2017 Bluecoats drumline. The sheet music is available exclusively from Tapspace. Click here to check it out! IN THIS ISSUE: VDL on TV, New Releases: Chorea Luna (Max Marsillo), Hummingbird (Michael Charles Smith), Epic Proportions (Jonathan Ovalle), Tesseract (ensemble version; Francisco Perez), Bad Juju (Chad Heiny), Pop Drop (Brian Slawson), Elements (Chad Heiny), VDL Users Group on Facebook, Tapspace Mixtape 17.07 edition.